SHRIMANT DAGDUSETH HALWAI - Over the last few years, this temple has become a landmark on Pune’s Ganesh Chaturthi celebration map owing to its lavish replicas of India’s popular heritage monuments. The 7.5-foot tall idol of Ganesha is adorned in the stunning jewellery worth of lakhs sitting proudly amidst the spectacular display of art and glittering lights. 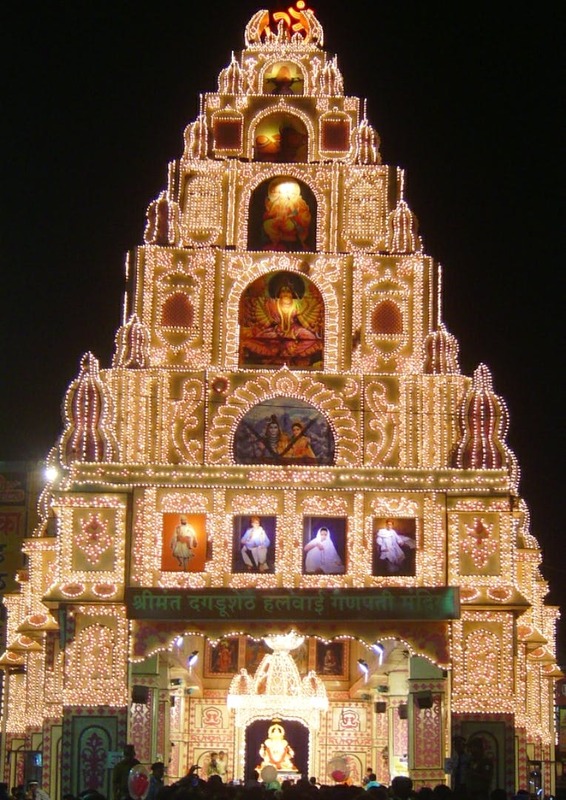 RAJARAM MANDAL - Rajaram Mandal near Vijay Theatre at Laxmi Road is celebrating the 125th year by creating a 65 ft high beautiful replica of Jejuri Fort, one of the most popular pilgrimages of Maharashtra. This one, like Dagduseth Temple, should be ideally visited during the evening hours to soak in its true glory. TULSIBAUG GANPATI - The Tulsibaug Ganpati is a huge 15 ft tall idol is made of fiber glass and holds the fourth rank of honour. This century old statue is decked up in more than 100 k of silver ornaments. KASBA GANPATI - Kasba Ganpati at Kasba Peth, the oldest and residing deity of Pune, gets the first honour in Manache Ganpati. The temple is known for organizing various social and cultural events such as blood donation camp, women empowerment activities, social awareness plays and children’s dance and music programs. The best time to visit these temples is early morning hours to avoid long pandal queues waiting to get a glimpse of the idols. However, the real beauty and decor come alive only amidst the evening city lights. On the August 27, 5000 dhol tasha performers will be performing together to set a new Guinness World Record at Balewadi Stadium. You shouldn't miss this one! Also, don't forget to try out the festive sweet i.e. modaks. You'll get them at Kaka Halwai, Khawakee and Chitale Bandhu.